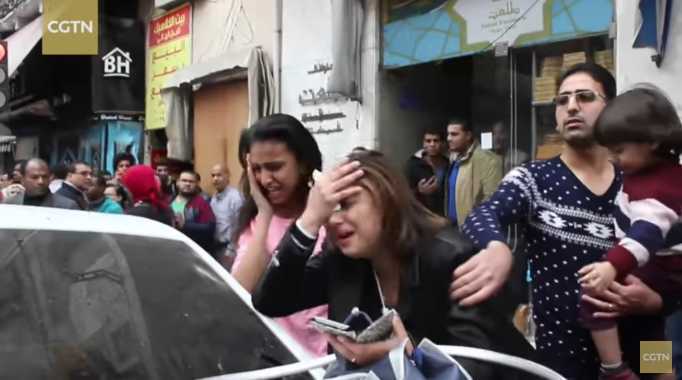 The barbaric Islamic group ISIS, which identifies itself as the Islamic State of Iraq and Syria, has claimed responsibility for bombings targeting two Egyptian Orthodox houses of worship on Sunday, which left 32 dead and more than 100 injured. “The Crusaders and their tails from the apostates must be aware that the bill between us and them is very large and they will be paying it like a river of blood from their sons, if Allah wills,” the terrorist organization said in a statement. According to reports, an explosion first shook St. George’s Church north of Cairo during Palm Sunday Services. There are conflicting reports as to whether a suicide bomber set off the blast or whether a bomb had been planted under the seat. Hours later, another explosion occurred at St. Mark’s Church in Alexandria as the Coptic Orthodox leader identified as Pope Tawadros II was finishing mass. A suicide bomber is believed to have carried out the deadly attack. Tawadros is among the survivors. Witness Fadi Sami told CNN that he left the building during the end of the service, only to return to find death and destruction. Egyptian President Abdel Fattah el-Sisi issued a statement condemning the blasts and ordering an investigation to find those responsible. “The attack will not undermine the resolve and true will of the Egyptian people to counter the forces of evil, but will only harden their determination to move forward on their trajectory to realize security, stability and comprehensive development,” he said. Nearly two months ago, ISIS released a video vowing to attack Egyptian “Crusaders,” advising that they are their “preferred prey.” It had already carried out an assault at St. Mark’s Coptic Cathedral in December, which killed 28. Abu Zubair Al-Masri also appeared in the footage, urging Muslims in Egypt to carry out attacks on behalf of the Islamic State. “O servants of the cross, o violators of agreements and treaties, know that the soldiers of the Islamic State have you in their sights and that our last attack on you was not the last, for the next attacks will be worse and more bitter,” he seethed.